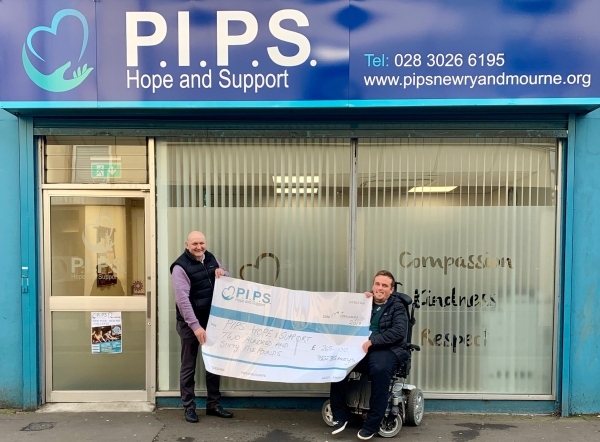 Kieran Lennon and all at Tam Barneys, Banbridge on December 25th 2018, held a bucket collection amongst patrons of the bar to raise funds for PIPS Hope and Support in memory of their friend David Lyness. On Thursday 17th January, we were delighted to meet Kieran who called to present us with the proceeds from the collection. PIPS Hope and Support wish to thank Kieran, Tam Barneys staff and patrons for their generosity. Kieran wishes to thank all his patrons, friends and Banbridge Silver Band for supporting the collection on the day.